This is one of my favorite things. It brings back memories of summer picnics in the park. I remember helping my mom cut the almond jello into squares. We would add ice cubes to the bowl to keep it cool. All you need is a packet of almond jello, a can of fruit cocktail, and a can of lychees. You make the jello first. 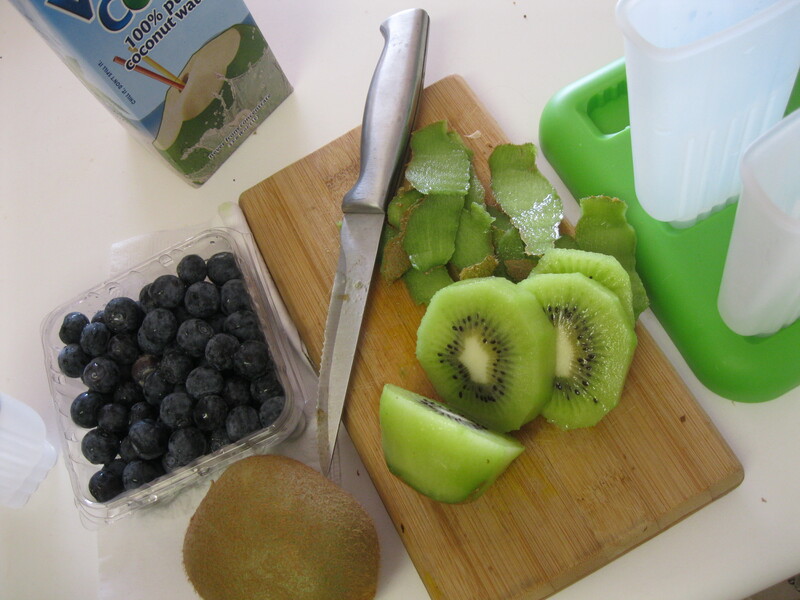 Once it’s formed, cut it into cubes and throw it into a large bowl with the other items. The jello will glide right out of the pan you put it in. You should be able to easily find almond jello in any Asian supermarket. The brand we use is agar-based. 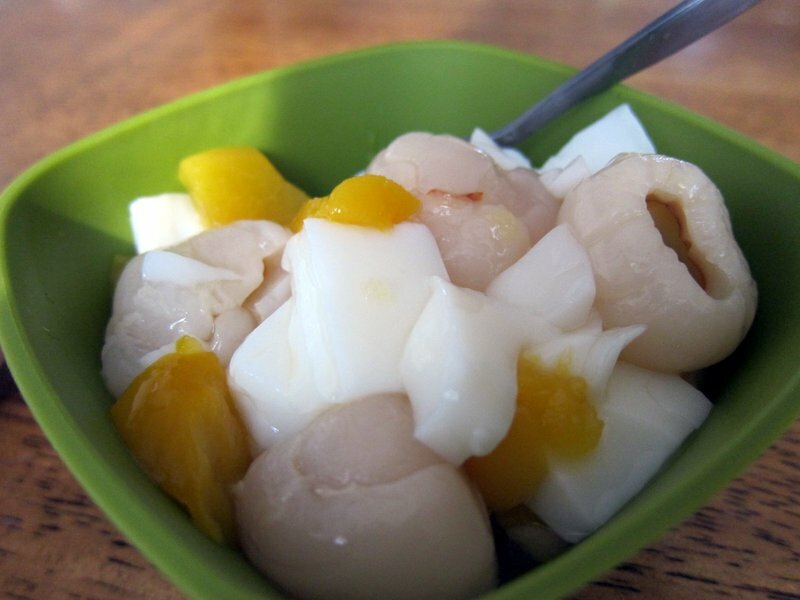 I found a recipe for making almond jello on HapaMama if you can’t find the mix. I love good food. In order to keep fitting into my same pants, I also exercise regularly. Those of you who have a rigorous work out routine, might have noticed that you can find yourself ravenously hungry within the hour after a strenuous exercise session. Fortunately most of my vigorous activities occur between the end of my work day and dinner so I’m mostly safe there but when I get home from the gym and have to wait to eat I like to have a snack that won’t spoil my appetite for something else nutritious later or ruin all of my hard work with empty calories. Notice, our hero has found a solution! 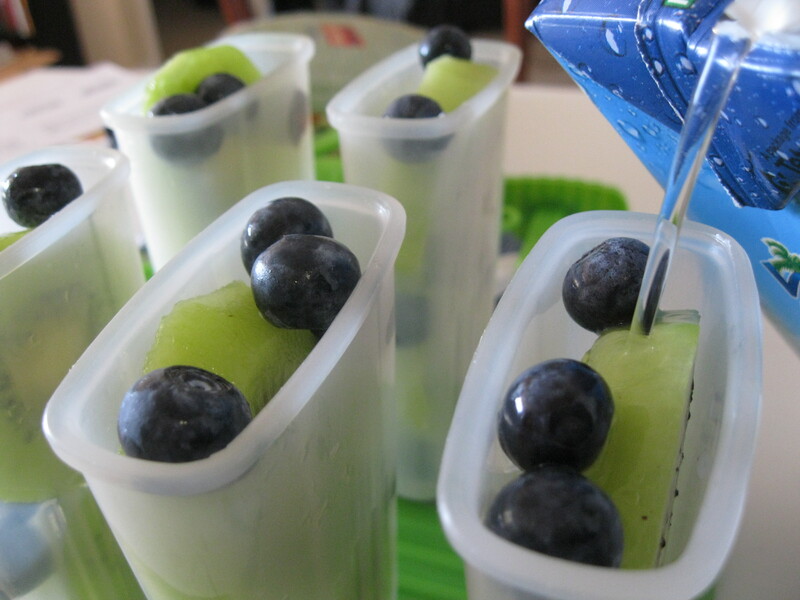 A good 6 popsicle mold costs $10-15 at your local home goods store and is a great way to create such a snack. 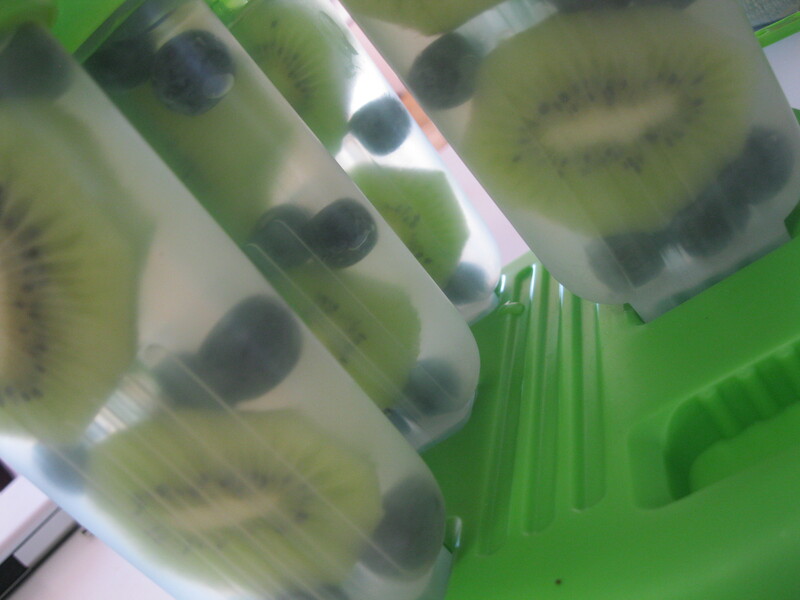 I just get whatever fruit is in season, slice it if necessary (or even puree it in the blender), pop it into the mold and fill it up the empty spaces with coconut water (something that <a href=”http://nevadagirls.wordpress.com/2012/03/15/im-throwing-my-hat-in-the-air-whos-that-girl/>NevadaGirl</a&gt; also champions as a delicious post workout hydrator).I don’t endorse any particular brand. I just look for the best bang for my buck. This style of popsicle will replenish some electrolytes, a little sugar, give you a little fiber and some vitamins to help you recover from your exercise session in the form of a cool refreshing snack. The combinations are endless so you’ll never get bored. Blueberries and kiwi is my favorite, but mixed berries and lime mango are close second place winners. If you want a protein pop, use soy milk instead of coconut water (in your blender with carob or chocolate powder if you’re so inclined). Chocolate blueberry, banana, or cherry pops are irresistible as far as I’m concerned. Heck, how about all three? Have a happy work out, folks!